I put in an Endless Summer hydrangea in my front door garden two years ago. It came through this winter quite well and promptly started filling out with shoots and the richly green, heart shaped leaves that are characteristic of hydrangeas. The Annabelle hydrangea never sulks the way the blue and variegated types do for me. 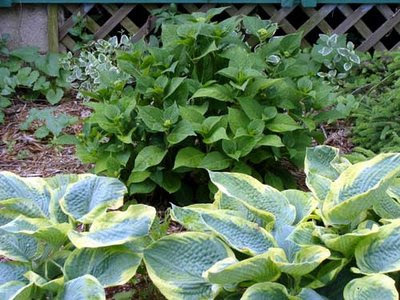 Those large variegated leaves are Frances Williams hostas unfolding in front. Hi Ilona! I have two Endless Summer Hydrangeas and I love them. They actually bloom all the time. Although, I read on one blog, don’t remember which one, that there are people who are disappointed with it. I think we have right conditions for it! Also, love your hostas! Wow, I love those Hostas, I might have to get me some to add to my collection! By all mean, put in hostas, and Frances Williams is a wonderful one. Living in the south, you will want to be sure they are in the shade: the leaves of this one can burn in the sun.